Learning To Knit: Will I master the needles? I have been looking at Knitting Handbooks lately, because I have decided that 2016 will be the "year of the needles" for me. I want to learn to knit or at least become better with what little (very little) skills I have in this hobby. I can do the basic knit stitch and the basic purl stitch but I'm very slow and awkward with the needles and yarn. So, I plan to ask my family for a couple of books that can help me in this journey. I know from my many years of crocheting that you need to practice, practice, practice in order become proficient in the craft. I am in no way a master in crochet but can hook my way around just about any pattern. 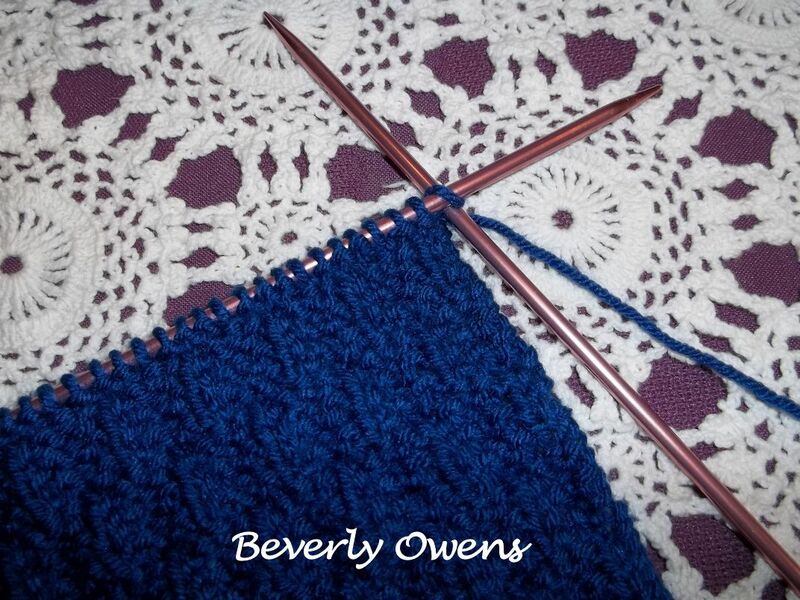 In order to get started, I am working on a scarf using the knitting needles and some blue yarn. If it turns out looking good, it will be a Christmas present for my husband; if it turns out looking like a 5 year old did it I can always use it as a dusting cloth. I figure that I won't learn unless I just dive in and work on something. A scarf seems like a good project to start with and I liked this pretty simple waffle stitch since it will give me practice with both the knitting stitch and the purl stitch, counting and working with the needles and yarn. 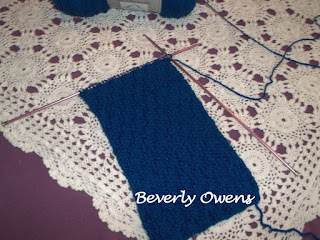 It won't be much different than crocheting a scarf in that you follow the pattern and remember when to do the knit stitch and when to do the purl stitch. I am finding it is a little harder to determine which row you are on unlike crochet where it seems more obvious but that may be a matter of training my eyes to look for certain stitches so that I will know. What books should I start with? I am thinking that the best place to start is with a book or two that covers the basics along with moving on to more advanced knitting techniques. Sure, I could just ask for a book with patterns but until I understand the basics, I know I will just get frustrated. In my search for the right book, this one caught my eye. I liked the title but then I think the book would be very helpful, too. Not only does the author cover the basics but she goes further in explaining more advanced knitting techniques and she does it with humor which I think I would enjoy. She also tells the reader how to fix mistakes (I'm sure I will make many) and that will be really helpful for my beginner skill level. I think I may be able to join the "chicks with sticks" (knitting needles) in the quest to make some fun and funky along with some traditional knitted items following Debbie Stoller's instructions. I know when I was first learning to crochet, the terminology sometimes confused the daylights out of me. I might see something like FPDC and think what the devil does that mean? Well, now I know it means to do a front post double crochet stitch and I also know how to do that with my yarn and hook. I am guessing that knitting will be no different. There are going to be directions in a pattern that will at first glance make no sense to me at all. So, this book looks like a wise choice for a beginning knitter like myself. What I like about this knitting handbook is that it promises to teach in plain English and not in terms that I am going to have to go to a glossary to figure out. I like that idea! Learning the way to use my needles and yarn to make something neat without having a thesaurus next to me to determine just what she is telling me to do. The basics in basic terminology, that sounds pretty darned helpful. It remains to be seen if I will learn to knit with the same confidence that I have for crocheting. I am determined, though. In the past the using of two needles instead of one hook just seemed to be beyond my capabilities but that was a mental block, I think. So, maybe I have passed the first hurdle...I CAN do this. It will take persistence and practice and I am willing to put in the hours to really learn to knit. I have some time left before Christmas morning to find out if my family paid attention and got me at least one of these books. So, in the meantime I am working on my little scarf that may be under the tree for my hubby or it might be in the rag drawer, only time will tell. By the way, the color I chose will look good on my husband and it is the team color for the Indianapolis Colts which is his favorite football team. I figure he might actually wear it, at least on game day, if it doesn't look too amateurish. Here is what I have so far. It is working up very slowly but I don't mind being the turtle in the race, after all that rabbit never wins anyway! I will continue to work with the yarn and needles and keep a piece of paper next to me to mark down which one of the rows I am doing in the repeat of the pattern to make the waffle look and hopefully it will turn out to be something my husband will be proud to wear. Would you believe I learned to knit before I learned to crochet? I learned the basics of knitting when I was still a young teen, maybe even pre-teen, I honestly can't remember for sure. Then I picked up a hook before I was 20 and you could say I was hooked on crochet. A few years later, I took an evening class offered by a local college on how to knit where I learned so much more about knitting terms, reading patterns, circular knitting needles (which are fabulous) and knit counters which make a world of difference. It was like learning a whole new craft! I made a few sweaters and then did the unthinkable. I returned to crocheting :) Still, I love knowing how to do both and I know you will enjoy mastering the art of knitting. Btw, that scarf is already beautiful! I know your husband will love it. It will be like receiving a hug from you every time he wears it. I think that I might always prefer crochet over knitting but the idea of knowing how to do both really appeals to me. I hope the scarf turns out well, I like the idea of him getting a hug from me every time that he wears it. Your scarf is beautiful, Bev! I love that waffle stitch pattern. I think I learned basic knit and purl stitches years ago, but then, for whatever reason, I taught myself to crochet instead. I applaud you for going into this new skill with a positive attitude and have every confidence that the Colts scarf will end up keeping your husband warm on game day for years to come. Looking forward to what you'll be able to show off a few months from now! Thank you, Susan. I am very determined to learn to knit better. 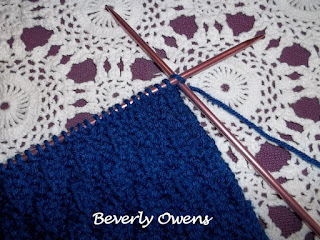 Good for you, Beverly, deciding to increase your yarn expertise with learning to knit. Like you, I'm happy with my crochet, but would also like to re-learn how to knit. Before crochet, I tried knitting and did several projects, including a baby sweater when I was pregnant with my 2nd child (that wasn't finished until nearly 5 years later for my 3rd child...lol). I gave up knitting some 40 years ago because I discovered crochet and never looked back. But I have become fascinated with several patterns I've seen recently for knitted designs in cotton washcloths and want to take up knitting again just to give them a try. I STILL have all my knitting needles and TONS of yarn from all my crochet projects, so all I need is to begin. Best of luck to you. Hope your family gifts you with some new knitting books this Christmas. I am sure that if you were to pick up those sticks again that you would make some lovely cotton washcloths. You do such a wonderful job with the little critters that you crochet.